Parents of school refusers, and those who have similar issues, meet on the last Friday of each month, from 7.30pm to 9.00pm at Reigate Baptist Church. I am told that it is a very informal meeting – a chance to support each other, share learning, swap books and occasionally hear from guest speakers. Run a local support group for families of 'school refusers', based in Redhill, Surrey, it was established by two mums whose children are unable to go to school. Understanding the stress this creates, and how hard it can be to access the right help, they believe the best support comes from other families and their own experiences, and this group was set up to facilitate this shared learning. Everyone is welcome, and you don't have to be local! Further details from fran @ shoutaboutit.net (remove the gaps). *image taken from a new website due to be launched soon. Ensuring a good education for children who cannot attend school because of health needs - Government policy for England and Wales. The Government’s policy intention is that all children, regardless of circumstance or setting should receive a good education to enable them to shape their own futures. Therefore alternative provision and the framework surrounding it should offer good quality education on par with that of mainstream schooling, along with the support pupils need to overcome barriers to attainment. This support should meet a pupil’s individual needs, including social and emotional needs, and enable them to thrive and prosper in the education system. This is statutory guidance from the Department for Education. Local authorities (LAs) must have regard to it when carrying out their duty to arrange suitable full-time education (or part-time when appropriate for the child’s needs) for children ho are unable to attend a mainstream or special school because of their health. This duty applies to all children and young people who would normally attend mainstream schools, including Academies, Free Schools, independent schools and special schools, or where a child is not on the roll of a school. It applies equally whether a child cannot attend school at all or can only attend intermittently. There is a technical problem with mobile devices, particularly Apple ipads, attempting to access the forum. I have added a new link on the meu as a workaround which views the forum outside the website. Keeping the website going is a rising expense. I would be grateful if those who feel able would make a donation of whatever they feel is appropriate. Amanda Egan revealed how sitting in her car outside her son Ben's school all day, every day, for three years, ensured he stayed in school. Like many parents, Amanda was no stranger to the stresses of the morning school run. However when her son Ben, now 17, began his first day in a new secondary school her world was turned upside down when he became terrified at the thought of going. Ben had developed crippling school refusal, an irrational fear of school or school situations. To help her son beat his condition, Amanda sat outside the school grounds for three years. 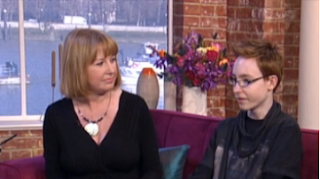 She joins us on the sofa with Ben and psychologist Laverne Antrobus to discuss school phobia. Linda has published news of new laws in her neck of the woods in an article in the Forum. If a child is absent for more than 5 days per year without a reasonable excuse, then the school will be able to fine the parents $70. Reasons for absence that can be accepted include illness, disability and School Refusal. This acceptance of School Refusal is, I think a breakthrough. However, as Linda points out, it is the difficulty we have in explaining School Refusal to the school, especially in the early days, that could easily leave parents open to that fine. Linda highlights other concerns that we should all consider. Why force teenagers to get out of bed early? On Mondays, Tuesdays and Wednesdays 14- to 18-year-old pupils in a Tonbridge, Kent college start lessons at 11.30am – because research suggests that that teenagers' brains work better if they get up later. There are few more powerful urges than the teenager's need to stay under the duvet when the morning school bell goes. Jon Barker, headteacher of Hugh Christie Technology College in Tonbridge, Kent accepts this and goes with the flow. "Their punctuality and attendance has improved, their questioning and answering is better because they are more alert and the pace of lessons is often much quicker," Barker says.